This picture shows the layers of the skin. 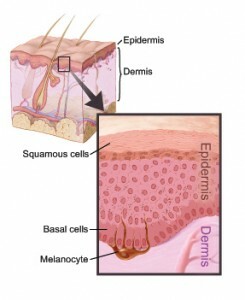 Understanding Skin CancerSkin cancer begins in cells, the building blocks that make up the skin. Normally, skin cells grow and divide to form new cells. Every day skin cells grow old and die, and new cells take their place. Sometimes, this orderly process goes wrong. New cells form when the skin does not need them, and old or damaged cells do not die when they should. These extra cells can form a mass of tissue called a growth or tumor. Malignant growths are generally more serious than benign growths. They may be life-threatening. However, the two most common types of skin cancer cause only about one out of every thousand deaths from cancer. Risk FactorsDoctors cannot explain why one person develops skin cancer and another does not. However, we do know that skin cancer is not contagious. You cannot “catch” it from another person. Research has shown that people with certain risk factors are more likely than others to develop skin cancer. A risk factor is something that may increase the chance of developing a disease. Ultraviolet (UV) radiation:UV radiation comes from the sun, sunlamps, tanning beds, or tanning booths. A person’s risk of skin cancer is related to lifetime exposure to UV radiation. Most skin cancer appears after age 50, but the sun damages the skin from an early age.UV radiation affects everyone. But people who have fair skin that freckles or burns easily are at greater risk. These people often also have red or blond hair and light-colored eyes. But even people who tan can get skin cancer. Actinic keratosis: Actinic keratosis is a type of flat, scaly growth on the skin. It is most often found on areas exposed to the sun, especially the face and the backs of the hands. The growths may appear as rough red or brown patches on the skin. They may also appear as cracking or peeling of the lower lip that does not heal. Without treatment, a small number of these scaly growths may turn into squamous cell cancer. Bowen’s disease: Bowen’s disease is a type of scaly or thickened patch on the skin. It may turn into squamous cell skin cancer. It is best to stay out of the midday sun (from mid-morning to late afternoon) whenever you can. You also should protect yourself from UV radiation reflected by sand, water, snow, and ice. UV radiation can go through light clothing, windshields, windows, and clouds. Wear long sleeves and long pants of tightly woven fabrics, a hat with a wide brim, and sunglasses that absorb UV. Use sunscreen lotions. Sunscreen may help prevent skin cancer, especially broad-spectrum sunscreen (to filter UVB and UVA rays) with a sun protection factor (SPF) of at least 15. But you still need to avoid the sun and wear clothing to protect your skin. Stay away from sunlamps and tanning booths. SymptomsMost basal cell and squamous cell skin cancers can be cured if found and treated early. Checking your skin for new growths or other changes is a good idea. A guide for checking your skin is below. Keep in mind that changes are not a sure sign of skin cancer. Still, you should report any changes to your health care provider right away. You may need to see a dermatologist, a doctor who has special training in the diagnosis and treatment of skin problems. DiagnosisIf you have a change on the skin, the doctor must find out whether it is due to cancer or to some other cause. Your doctor removes all or part of the area that does not look normal. The sample goes to a lab. A pathologist checks the sample under a microscope. This is a biopsy. A biopsy is the only sure way to diagnose skin cancer. Which type of biopsy do you recommend for me? StagingIf the biopsy shows that you have cancer, your doctor needs to know the extent (stage) of the disease. In very few cases, the doctor may check your lymph nodes to stage the cancer. TreatmentSometimes all of the cancer is removed during the biopsy. In such cases, no more treatment is needed. If you do need more treatment, your doctor will describe your options. Your doctor may refer you to a specialist, or you may ask for a referral. Specialists who treat skin cancer include dermatologists, surgeons, and radiation oncologists. Before you have treatment, you might want a second opinion about the diagnosis and treatment plan. Many insurance companies cover a second opinion if you or your doctor requests it. It may take some time and effort to gather medical records and arrange to see another doctor. Usually it is not a problem to take several weeks to get a second opinion. In most cases, the delay will not make treatment less effective. To make sure, you should discuss this delay with your doctor. Sometimes people with skin cancer need treatment right away. NCI’s Cancer Information Service, at 1-800-4-CANCER, can tell you about nearby treatment centers. Information Specialists also can provide online assistance through LiveHelp at http://www.cancer.gov/cis. Will the treatment affect my appearance? If so, can a reconstructive surgeon or plastic surgeon help? What is the treatment likely to cost? Does my insurance cover this treatment? Surgery is the usual treatment for people with skin cancer. In some cases, the doctor may suggest topical chemotherapy, photodynamic therapy, or radiation therapy. Because skin cancer treatment may damage healthy cells and tissues, unwanted side effects sometimes occur. Side effects depend mainly on the type and extent of the treatment. Side effects may not be the same for each person. Before treatment starts, your doctor will tell you about possible side effects and suggest ways to help you manage them. Many skin cancers can be removed quickly and easily. Even so, you may need supportive care to control pain and other symptoms, to relieve the side effects of treatment, and to ease emotional concerns. Information about such care is available on NCI’s Web site at http://www.cancer.gov/cancertopics/coping, and from Information Specialists at 1-800-4-CANCER or LiveHelp. You may want to talk to your doctor about taking part in a clinical trial, a research study of new ways to treat cancer or prevent it from coming back. The section on “The Promise of Cancer Research” has more information about clinical trials. The time it takes to heal after surgery is different for each person. You may be uncomfortable for the first few days. However, medicine can usually control the pain. Before surgery, you should discuss the plan for pain relief with your doctor or nurse. After surgery, your doctor can adjust the plan if you need more pain relief. Surgery nearly always leaves some type of scar. The size and color of the scar depend on the size of the cancer, the type of surgery, and how your skin heals. For any type of surgery, including skin grafts or reconstructive surgery, it is important to follow your doctor’s advice on bathing, shaving, exercise, or other activities. What kind of surgery will I have? What will the scar look like? Can anything be done to help reduce the scar? Will I need plastic surgery or reconstructive surgery? Am I likely to have infection, swelling, blistering, or bleeding, or to get a scab where the cancer was removed? These drugs may cause your skin to turn red or swell. It also may itch, hurt, ooze, or develop a rash. It may be sore or sensitive to the sun. These skin changes usually go away after treatment is over. Topical chemotherapy usually does not leave a scar. If healthy skin becomes too red or raw when the skin cancer is treated, your doctor may stop treatment. Do I need to take special care when I put chemotherapy on my skin? What do I need to do? Will I be sensitive to the sun? The NCI fact sheet “Photodynamic Therapy for Cancer: Questions and Answers” has more information. Will I need to stay in the hospital while the chemical is in my body? Side effects depend mainly on the dose of radiation and the part of your body that is treated. During treatment your skin in the treated area may become red, dry, and tender. Your doctor can suggest ways to relieve the side effects of radiation therapy. Also, the NCI booklet Radiation Therapy and You offers more information. How will I feel after the radiation? Am I likely to have infection, swelling, blistering, or bleeding, or to get a scar in the treated area? How should I take care of the treated area? Follow-up CareFollow-up care after treatment for skin cancer is important. Your doctor will monitor your recovery and check for new skin cancer. New skin cancers are more common than having a treated skin cancer spread. Regular checkups help ensure that any changes in your health are noted and treated if needed. Between scheduled visits, you should check your skin regularly. You will find a guide for checking your skin below. You should contact the doctor if you notice anything unusual. It also is important to follow your doctor’s advice about how to reduce your risk of developing skin cancer again. Facing Forward: Life After Cancer Treatment is an NCI booklet for people who have completed their treatment. It answers questions about follow-up care and other concerns. It has tips for making the best use of medical visits. It also suggests ways to talk with the doctor about creating a plan of action for your recovery and future health. Sources of SupportSkin cancer has a better prognosis, or outcome, than most other types of cancer. Still, learning you have any type of cancer can be upsetting. You may worry about treatments, managing side effects, and medical bills. Doctors, nurses, and other members of the health care team can answer your questions. Meeting with a social worker, counselor, or member of the clergy can be helpful if you want to talk about your feelings or concerns. Often, a social worker can suggest resources for financial aid, transportation, or emotional support. Support groups also can help. In these groups, patients or their family members meet with other patients or their families to share what they have learned about coping with cancer and the effects of treatment. Groups may offer support in person, over the telephone, or online. You may want to talk with a member of your health care team about finding a support group. The Promise of Cancer ResearchDoctors are conducting clinical trials (research studies in which people volunteer to take part). Clinical trials are designed to answer important questions and to find out whether new approaches are safe and effective. Research already has led to advances, such as photodynamic therapy, and researchers continue to search for better ways to prevent and treat skin cancer. People who join clinical trials may be among the first to benefit if a new approach is effective. And even if participants do not benefit directly, they still make an important contribution by helping doctors learn more about the disease and how to control it in other patients. Although clinical trials may pose some risks, researchers do all they can to protect their patients. If you are interested in being part of a clinical trial, talk with your doctor. You may want to read the NCI booklet Taking Part in Cancer Treatment Research Studies. It explains how clinical trials are carried out and explains their possible benefits and risks. NCI’s Web site includes a section on clinical trials at http://www.cancer.gov/clinicaltrials. It has general information about clinical trials as well as detailed information about specific ongoing studies of skin cancer. Information Specialists at 1-800-4-CANCER or at LiveHelp at http://www.cancer.gov can answer questions and provide information about clinical trials. How To Do a Skin Self-ExamYour doctor or nurse may suggest that you do a regular skin self-exam to check for skin cancer, including melanoma. National Cancer Institute PublicationsNCI provides publications about cancer, including the booklets and fact sheets mentioned in this booklet. Many are available in both English and Spanish. You may order these publications by telephone, on the Internet, or by mail. You may also read them online and print your own copy. By telephone: People in the United States and its territories may order these and other NCI publications by calling the NCI Cancer Information Service at 1-800-4-CANCER (1-800-422-6237). On the Internet: Many NCI publications may be viewed, downloaded, and ordered from http://www.cancer.gov/publications on the Internet. People in the United States and its territories may use this Web site to order printed copies. This Web site also explains how people outside the United States can mail or fax their requests for NCI booklets.